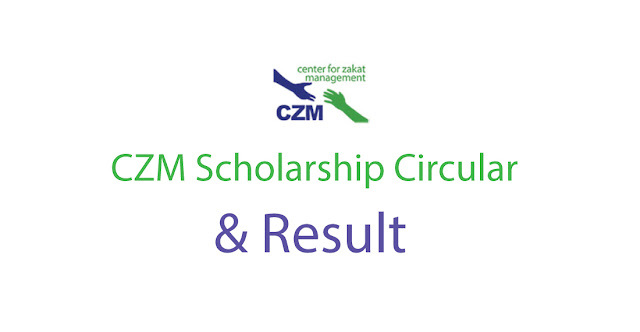 CZM published scholarship circular 2019 for poor and meritorious students. It is a social program run by CZM. The students who admitted this year can apply for CZM scholarship 2019. Deadline for sending self-filled hard copy form: 28 February, 2019. Note: Application Time has been increased. Last date now 15 March, 2019. Center for Zakat Management (CZM) has been implementing Genius Scholarship Program since 2010 for the purpose of providing Zakat education to the underprivileged students. This year, all public universities and government medical colleges across the country are invited to apply for the first year of graduation in the first year from the newly recruited students whose family can not afford to spend education. To fulfill your hand, a hardcopy form can be downloaded through the download application form by clicking on the button below. Note: All the relevant people are specifically requested to not make calls to our contact numbers due to unnecessary or unreadable / insufficient access to the instructions given in the notification form and application form. Contact time for urgent need of occupation: Robi - Thursday 10:00 am - 4:00 pm (excluding public holidays and weekly holidays); You can send sms or email anytime. All information collected with the application form will be used only for consideration of the entitlement to receive scholarship and strictly confidentiality will be maintained regarding these information. WARNING: Various notifications of Genius Scholarship Program and communication numbers mentioned in the form, 01783 55 88 22, 09613 00 11 76, if any contact with the name of the CGDM through call or SMS, and if any one is cheated then its liability is to be borne by CGDM authorities Will not All concerned have been advised to remain vigilant.